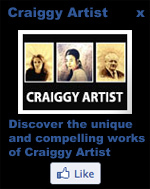 Welcome to Craig Robertson Online Art Gallery's affiliate link exchange program. If you would like your banner displayed here simply click "add your site" and fill out the application form. Once you have your code, place a reciprical link on your site with your choice of one of my banners from my banner farm. When a visitor arrives via your site they will be directed to my main page but your refferal will count on the affiliates list much in the same way as a toplist works.